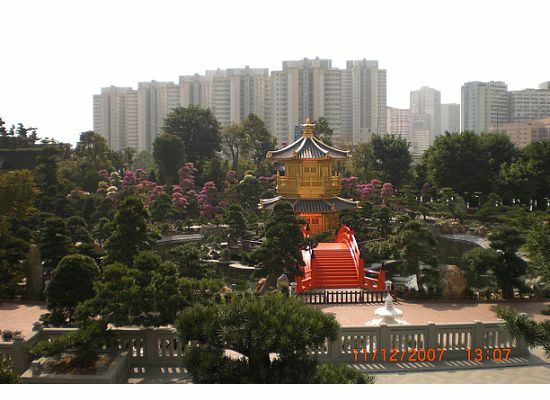 The Nan Lian Garden Hong Kong is an extension of the Chi Lin Nunnery. My husband and I were there twice within one trip. 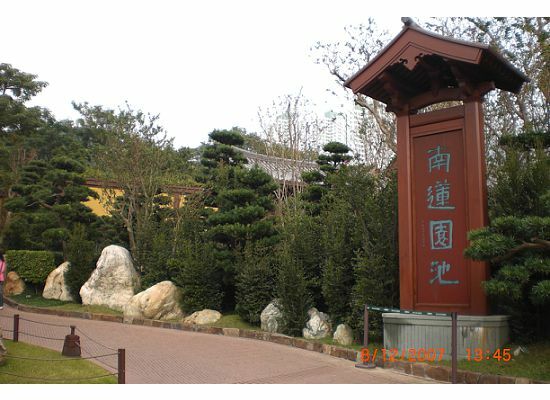 The main theme of the garden is to show traditional Chinese landscaping. 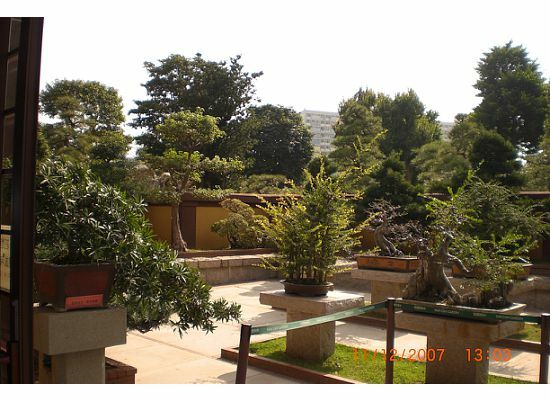 There are 3 main exhibition halls and 2 tea houses, a big fish pond, a waterfall and a few small buildings which are the common set up of the riches in their gardens in the past. The first exhibition hall shows a scaled down miniature of several buildings built in the past which still exist today. The models highlight some of the differences between the building styles. 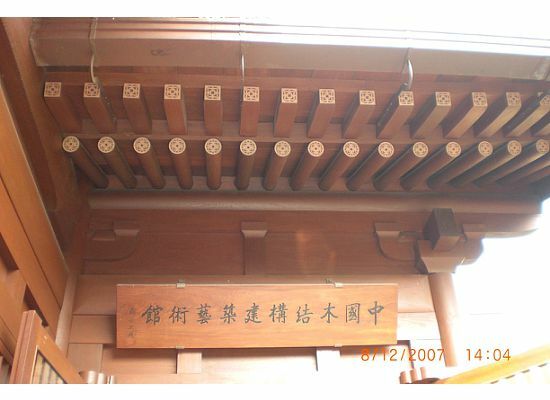 The best of all, it shows you how the buildings were put together without the use of nails, but just the intricate wood joinery. There is a real size display of how that system worked in the past. 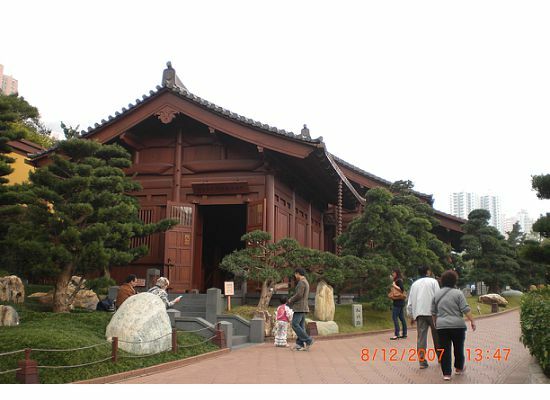 It is also the building method applied in the buildings of this garden and Chi Lin Nunnery. Those small exhibits fascinated Perry the most. Photography is prohibited in this exhibition hall. 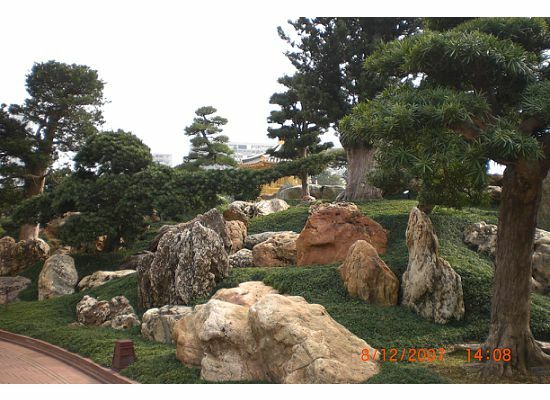 Along the way to the second exhibition hall, there are many different plantings and stones used in the garden. They are all very precious, in that it can take hundreds of years to grow or form. Therefore, you will see some security guards around and politely request that you do not touch them. 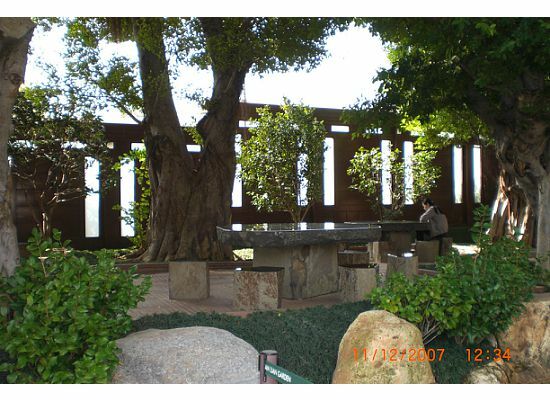 Throughout the garden, you can see many of these precious stones and trees. Aren't they beautiful? More Chinese landscaping and garden layout on the way to the Octagonal Pavilion. See the garden furniture in the middle? You can't get through the gate in front of the Pavilion. I was so fortunate to take this picture without any people standing in front of the gate. There are always people standing in front of it to take pictures. It will take you several minutes before it is your turn. We never did that. After a while, you will start to smell some fragrance which is very natural and welcoming. 'Cos you have just arrived in the "Fragrance Hall". The second exhibition hall, also called the "Fragrance Hall", always has special exhibitions. The first year when we were there in 2007, we did not need to pay an admission fee. 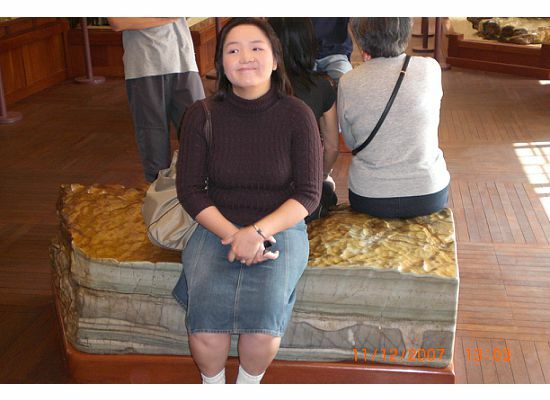 But when I went back in 2009, there is a HK$15 admission fee per person. In front of the entrance of the exhibition hall, there is interactive TV to give you brief introduction about the special exhibitions. The plaque on top of the entrance of the "Fragrance Hall"
After that, you will see a HUGE "Blue Pond" with all the expensive red, silver, gold and pearl Koi fish. The pond is really big. 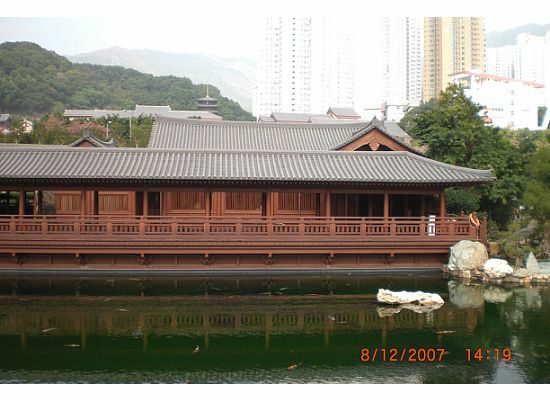 Across the pond, you will see a cedar wood Pavilion of Chinese Pagoda where one of the tea houses is located. You can step in to enjoy tea as you walk further away and round the corner after the pond in order to get to its entrance. 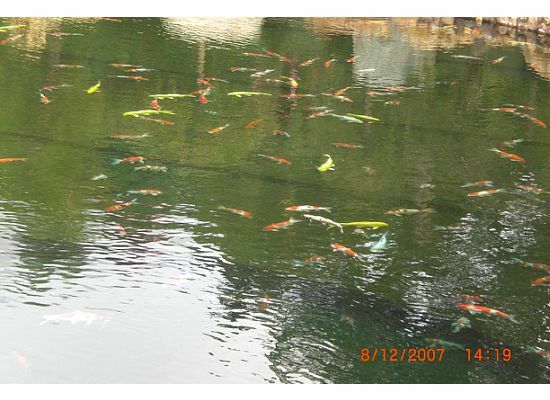 Look at all those beautiful Koi fish. There must be at least 100 of them in the "Blue Pond". They worth thousands of dollars. If you keep going....you will come across a waterfall about 100 feet away from the pond. Look closely...there is another tea house behind it. Can you see the people behind the waterfall? 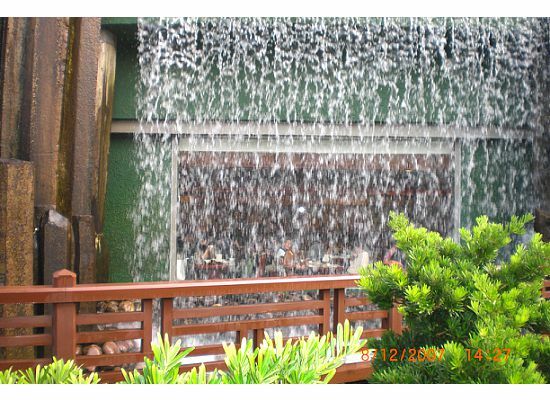 You don't know how many times I tried to convince my mom that there is a restaurant behind the waterfall until she saw the picture above. 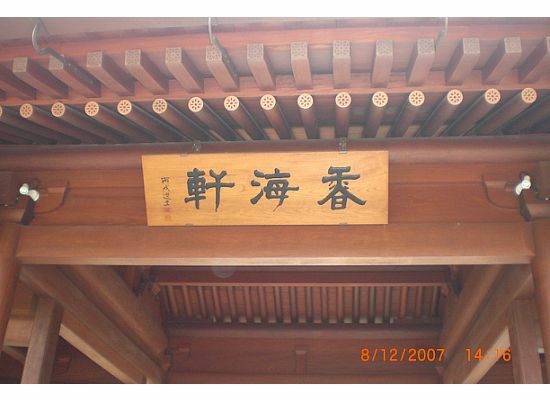 When I went back in 2009, my family and I came to this place for lunch. They serve traditional vegetarian food. If you like to eat healthy and like steamed food, you will love this place. Check out our Hong Kong Vegetarian Restaurants page for more details about this restaurant. 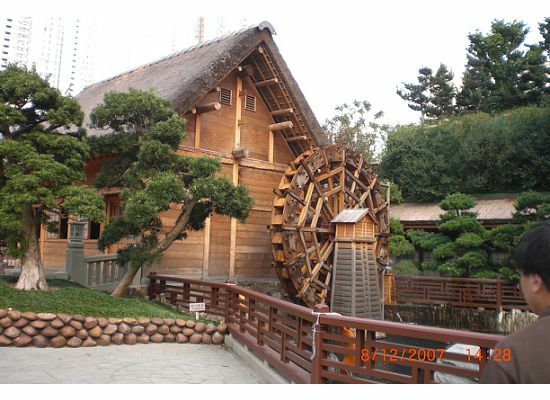 Next to the restaurant, in the Nan Lian Garden Hong Kong, there is a Mill. 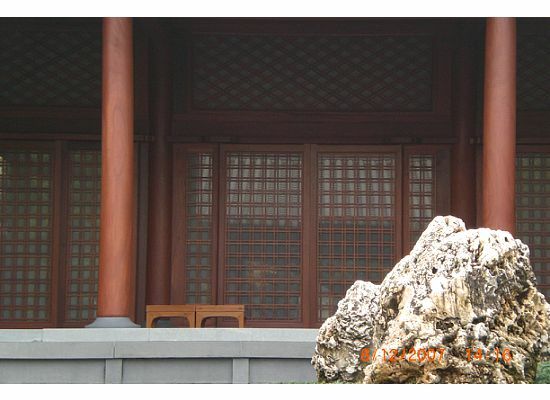 Across from the mill, it is the entrance of the tea house in the cedar wood Pavilion of the Chinese Pagoda where you saw from the "Blue Pond". Turning the corner, it is the souvenir store. They have some gorgeous ceramic China which are very expensive. The prices are around US$100 - US$1,000 a piece. But the artwork definitely makes it worth every penny. They also have some reasonably priced souvenirs which costs around US$5 a piece. 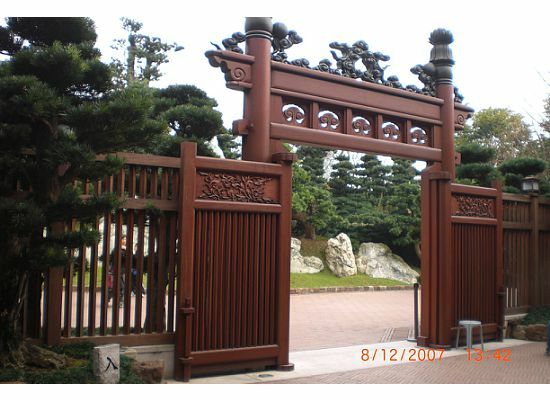 Be aware that some souvenirs are available in the stores out of the Nan Lian Garden Hong Kong as well. In my opinion, you may be better off to save the extra money if you plan on shopping around later. Less than 100 feet away, there is another exhibition hall that displays many rocks. They are stunningly beautiful. And you know what? You can sit on them. "Man....on a hot summer day, sitting on those rocks just cools you down inside and out". Feel free to try it. Outside of this exhibition hall, there are many gorgeous potted plants.They look very similar to the Japanese "Bon Sai". Remember, Japanese inherited a lot of Chinese culture. This is part of it. 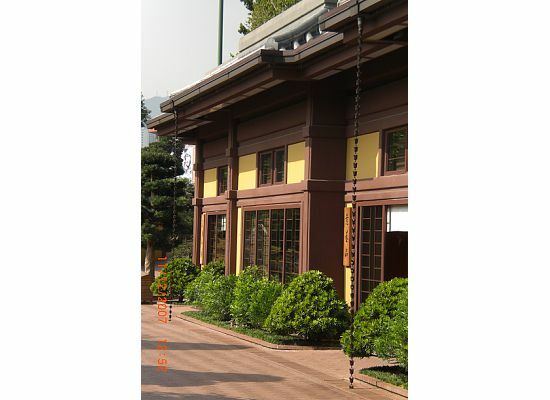 Not long after leaving this hall, you can either exit the garden or walk up to the bridge and check out the HK Chi Lin Nunnery. 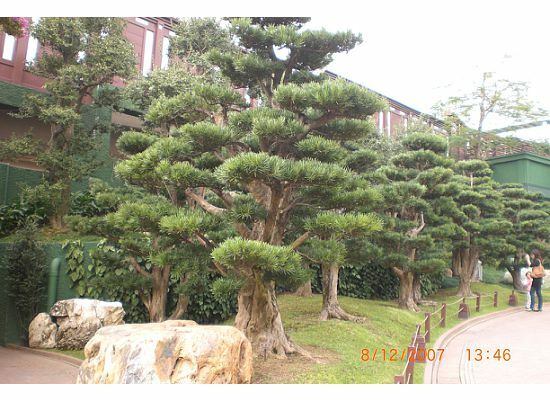 The 2 visits that I have made to the Nan Lian Garden Hong Kong were 2 years apart from each other. Some of the scenic spots deteriorated a bit. They didn't break, but just aged a lot compared to my first visit when it was brand new. 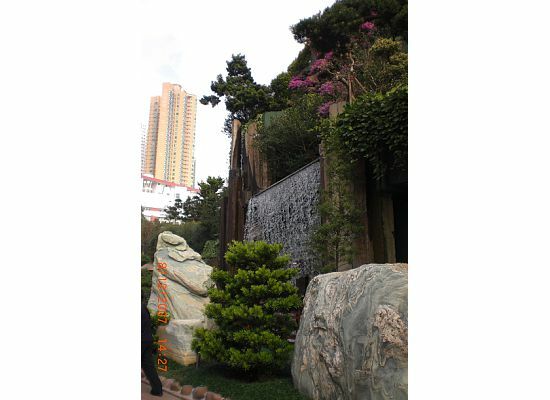 Learn more about the Nan Lian Garden Hong Kong.